In 1954, on fertile lands close to the capital of Chile, an important politician and businessman, Mr. Máximo Valdés, founded the vineyard "Houses of Pirque". With extensive experience in the wine business, he begins planting Cabernet Sauvignon, Merlot, Sauvignon Blanc and Chardonnay. After half a century and four generations, the Valdés family has turned these vineyards in the best example of love for the land, and perfection in the quality of its products. 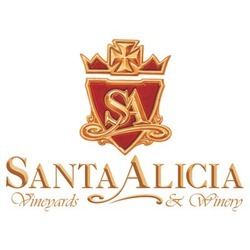 Today, identified as "Santa Alicia", as a way of honoring the women that in each generation carry this name, the vineyard continues with its tradition of excellence and prestige, expressed in each bottle are the decades of experience, high technology, and the privileged fruit which results from a marvelous environment.